We’ve had a pretty crazy week around here so I’m looking forward to some major relaxation this evening with the hubs and our girls. The temps didn’t get above 80 here the past couple of days and that has really put me in the mood for all things Fall! One of the things I love most about Northern California is the presence of actual seasons. I did not have that growing up in Florida, it was pretty much just hot all the time. Now, it won’t get really cold here until end of October/November but this little sneak peek of lower temps has me feelin’ pretty good, happy Friday! A couple of years ago, I decorated my house for Fall in September, took it down in October and put up Halloween, then took that down and put up Fall/Thanksgiving in November, and of course Christmas in December! It was quite a bit of work and so I didn’t do it last year but I found myself missing my decorations. Sophie and I got our Fall stuff out this week and it makes me so happy to see it, it’s Fall Y’all! I’ve been on the search for a Fall mug. I have a Halloween mug and a Christmas mug but not one for Fall. Now my sensible husband couldn’t understand why I wouldn’t just get a regular mug that could last all year long… now what fun would that be? With a plethora of Fall mugs available at Target, Marshalls and Michaels, it took me a while to look around but I finally found it. This little cup makes me so, so happy. And the price (only $4 at Marshalls) made me even happier! We’ve been taking music classes at the Grand Theatre Center for the Arts since we moved to Tracy back in 2014. I cannot say enough good things about their art education program. My girls just started two new classes there, well new to us. Lyla has wanted to take acting class for a few years now but was never old enough (age to start is 9). We gifted her with acting classes for her birthday this year and so far, she really loves it. Sophie started a pottery for preschoolers class and had her first session yesterday. I think it’s going be just like everything else they offer, great! I’ve used the Bare Minerals foundation powder for longer than I can remember. I really love that product but I’ve wanted to try something different for a while now. I feel like my skin has changed a lot and what I’m using now isn’t the right product for my face anymore. I worked for Clinique while I was in college and was pretty knowledgeable about makeup back then. Fast forward many years, and I feel like I know nothing at all! I headed into Ulta this week and after a great consultation, I left with three new products. I absolutely love them all! I decided to try a tinted moisturizer type of foundation and it’s working out wonderfully for me. I rely heavily on concealer and used to use a Bare Minerals one but the Ulta brand full coverage liquid concealer is awesome. I also picked up a hydrating face primer. This has been a game changer for me. It has helped my makeup and skin look so fresh. My budget for makeup is not what it used to be, nor would I want to spend a fortune on product these days anyways so the Ulta brand is perfect. They are high-quality products with an amazing price point. I’ve been loving putting on my makeup in the morning! I’ve always loved Tuna Helper. It’s a nostalgia thing – my stepdad would make it whenever my mom was out of town for work. I wanted to make a homemade version since we try not to eat many processed foods so I went searching online. This recipe was a hit with my family. I was worried how my kids would feel about it but my four year old even asked to eat it the next morning at 9am! I followed the recipe exactly but used whole milk instead of cream. It was so good. Happy Halloween Eve! 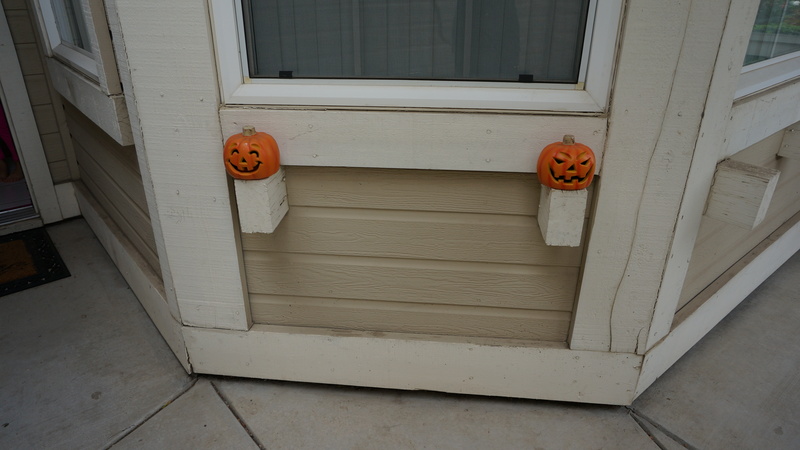 In honor of this awesome holiday, I thought I’d put together a quick post of our Halloween decorations. Here’s a look at our front porch area. I wish I’d done more here but it’s been a really busy month. We carved and painted pumpkins tonight (I took these pictures earlier today) so I’ll have to post a picture of the finished products later. I love this candle guy. He is sitting on the side table in our front room. He used to light up (he no longer does) but he has the most funny face and I still love him. 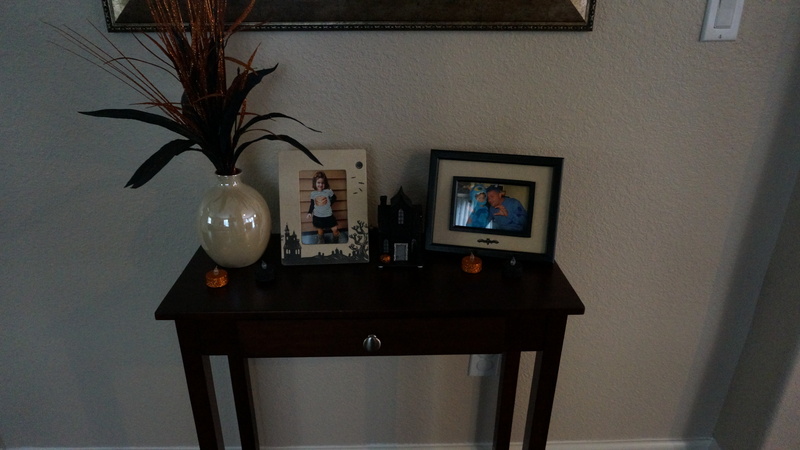 Our small entry way table has some old Halloween pictures in fun frames, a small glittery haunted house and some really cute LED glitter candles I found at Target in the dollar section – score! 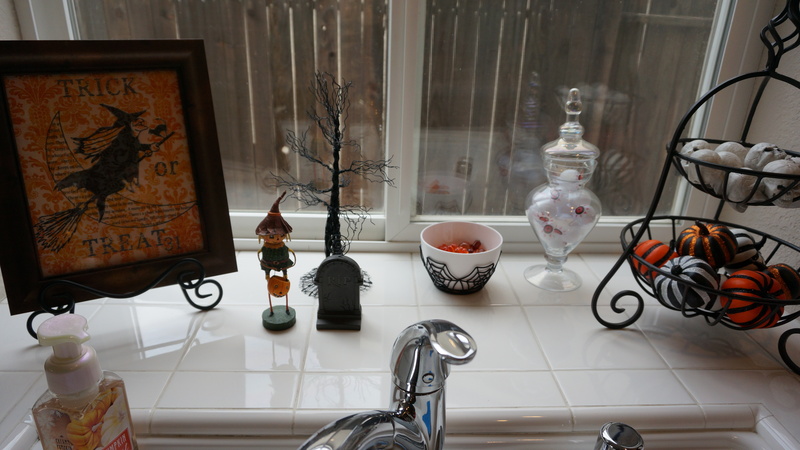 My favorite area of the house, by far, to decorate is the area behind the sink. 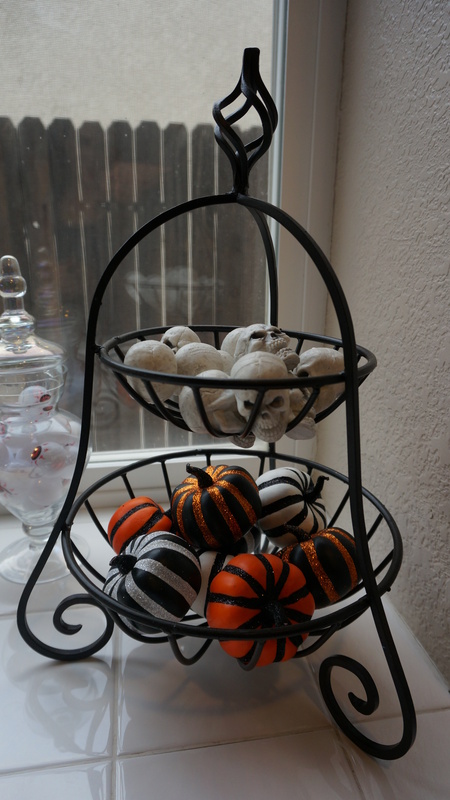 I found another great free printable online and filled the area with skulls, eyeballs and black and orange pumpkins – s0 fun! This little guy sits on the stove and he matches my Halloween kitchen towel perfectly. I spared you the picture of the towel because, well, it’s a towel. Lyla made this spider at Michael’s one Saturday. I found out online (I had no idea before this) that Michael’s does crafts on Saturday mornings for only $2. And you can go and shop around while your child does their craft. She really enjoyed it and I can’t wait to see what they have planned for Thanksgiving and Christmas. 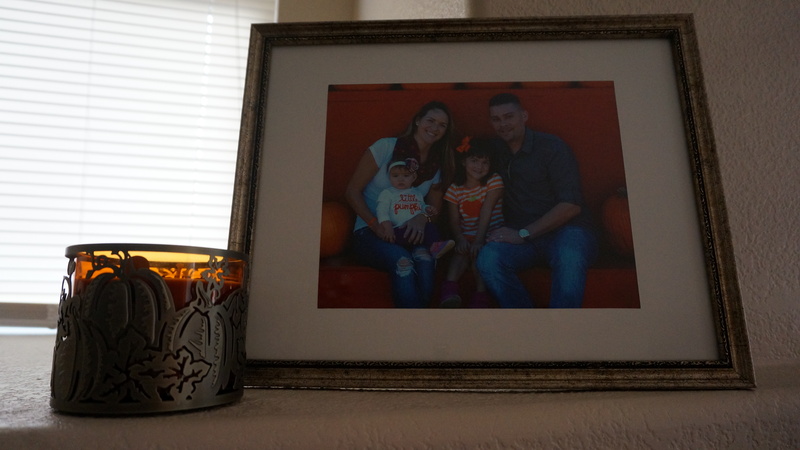 Here is our mantel. The banner is actually made of wood. I found it at HomeGoods for only $8. I was going back and forth on buying it and I’m so glad I decided to get it. 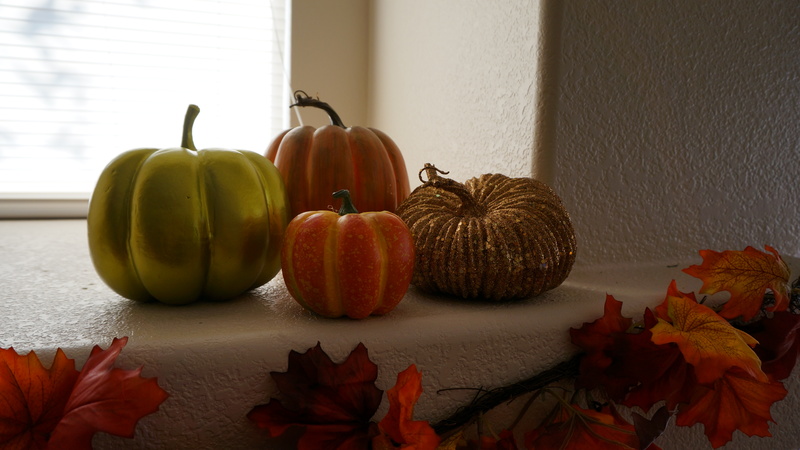 The colors go perfectly with the pumpkins I already had out for my Fall decorations and I feel it just completed the mantel perfectly. 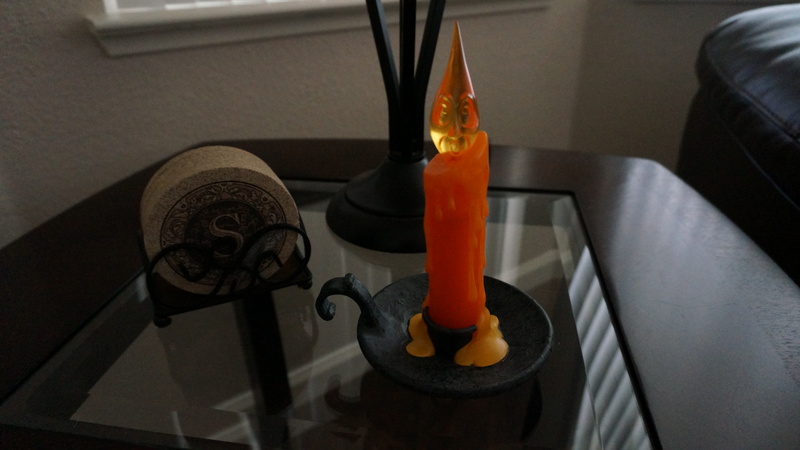 I had to get a close-up of the candle holder. My mom got it for me from Bath & Body Works and it is so beautiful. I’m not sure this picture does it justice because the detail on it is really, really pretty. And I believe it was really affordable. Looking at it I thought it would cost way a lot more than it actually did. I think it was just around or under $10. 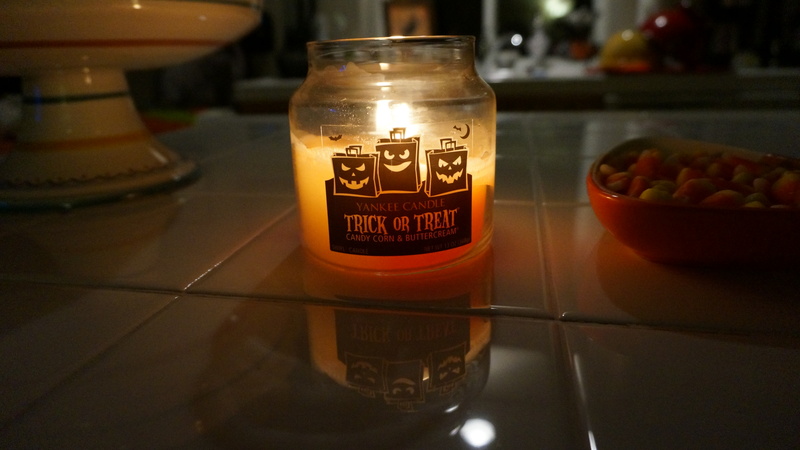 Lyla picked out this candy corn candle because she absolutely loves candy corn. 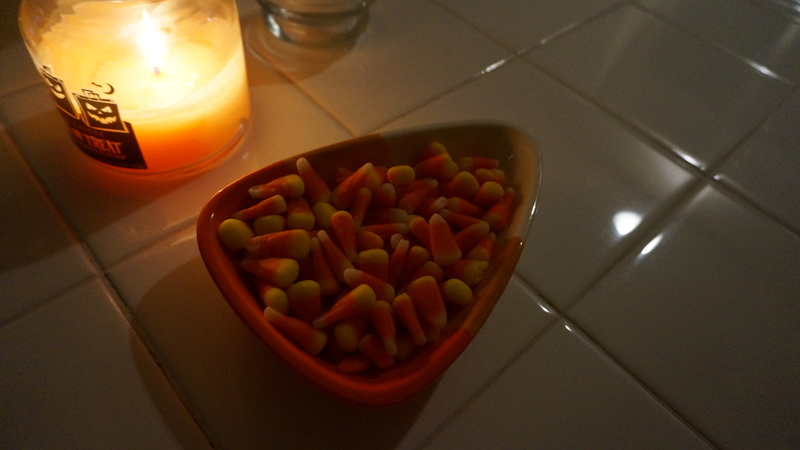 Next to it is my little candy corn dish. It’s really cute. You can’t see the colors but it looks just like a candy corn and I filled it with, you guessed it, candy corn! There you have it, our Halloween decor. I forgot to take pictures of the decorations in the girls rooms and they are both asleep now so unfortunately I won’t be able to show those. They both have a few things up in their rooms which they love and make them happy, which makes me happy 🙂 I think that may be the best part of all this decorating. I love to walk around my house and see all the fun decor but the girls, well only Lyla because Sophie is too little to realize, but Lyla really loves it and these are the types of special memories I love to create for her. Tomorrow is October 1st. Lyla is so excited about this. I love that she gets so happy about the seasons and holidays and all of that. I love to make a big deal out of holidays and I think being in Kindergarten intensifies it for her since they make a big deal of it too – so much fun! This weekend we’ll be hauling out our Halloween decorations so I thought it would be fun to take a look at what I put up for Fall. 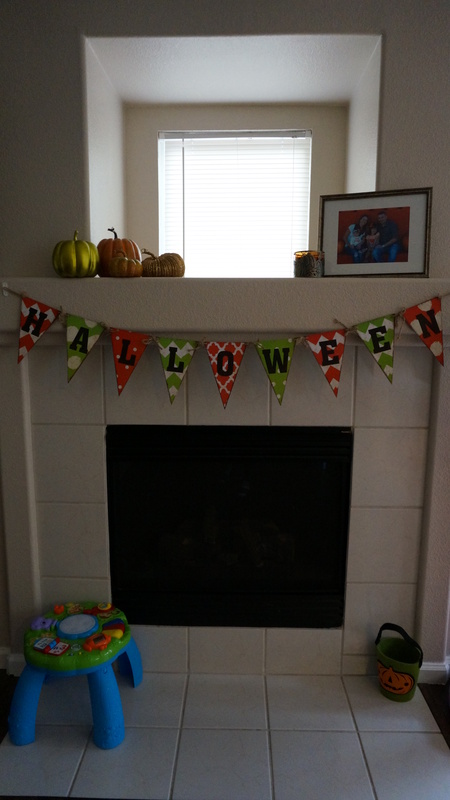 I put these decorations out in September, and this year we did it on September 22nd, the first day of Fall. Some of this will stay up during October for Halloween and some it will be put away and then put back out again in November. 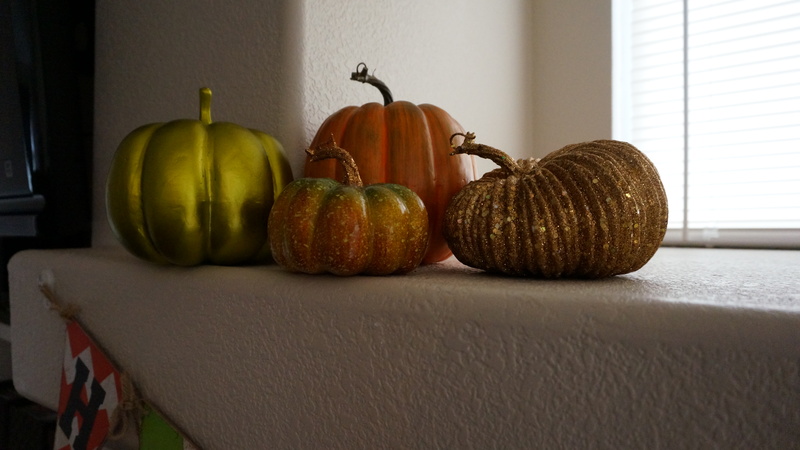 To me, the Fall season spans three months: September (Harvest), October (Halloween) and November (Thanksgiving), and I like to decorate for all of it! Some pieces can go all three months while some are more specific. 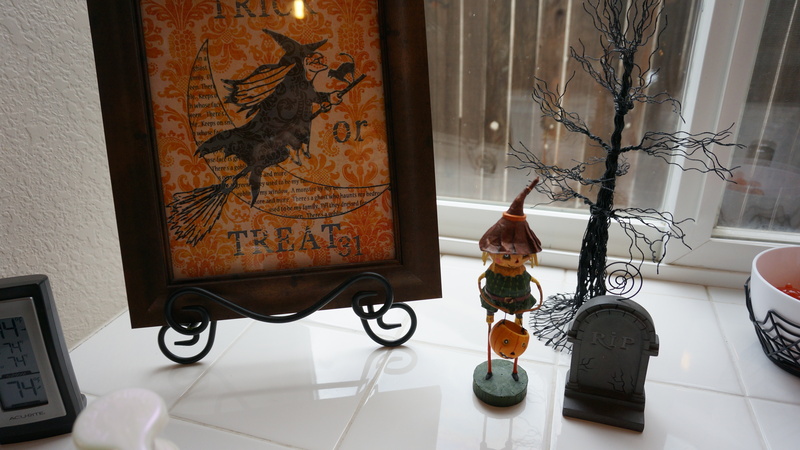 I truly hope you enjoy this little home tour of my Fall decorations. This may not seem like much to some but to me its beautiful. Now it may have come out a little differently if I was rolling in the dough but I do what I can on a budget and I love how everything looks. Nothing makes me happier than walking through my home and loving what I see – Happy Fall Y’all! This is our entryway table. 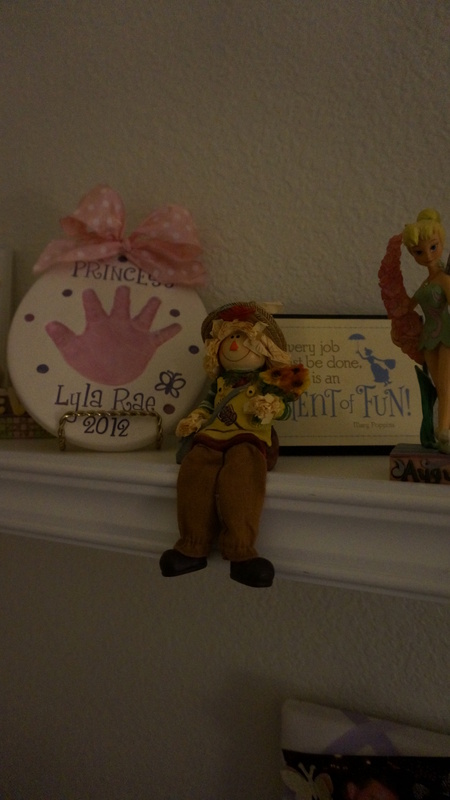 I love that I can change out each piece here – the flowers, sign, picture, candy bowl – to match the other seasons. I would like to make a burlap runner to go on our dining table, its needs a little something more. 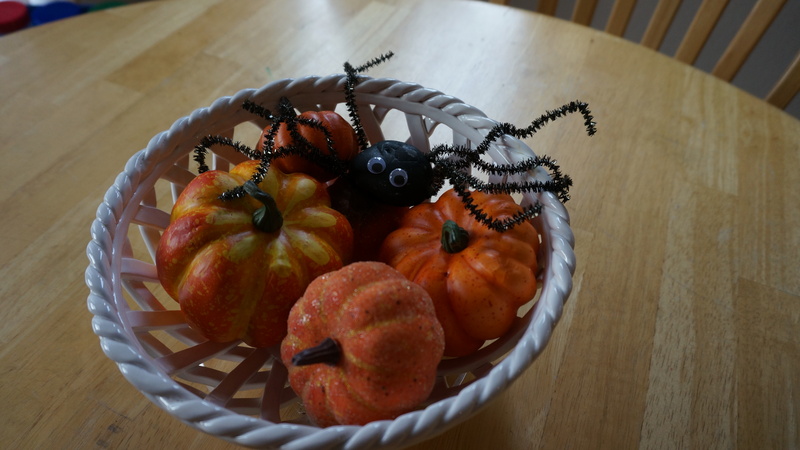 This pumpkin sits on the side table in our sitting area. 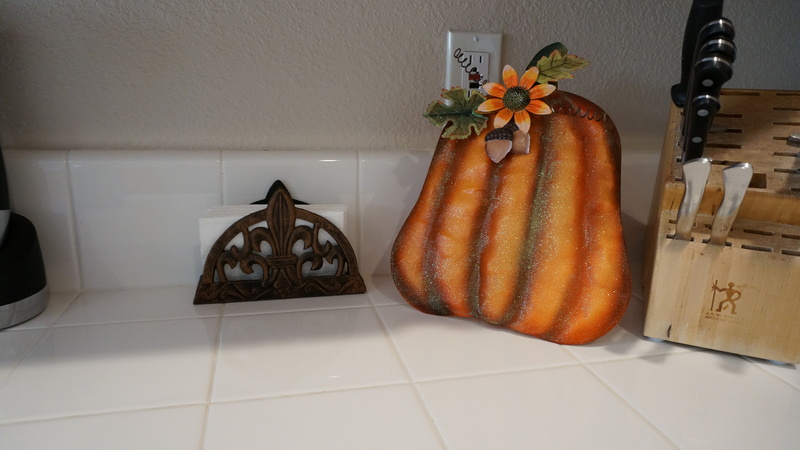 This ceramic pumpkin is one of my favorite decorations. We have a built-in office area and I was hesitant to put it there because its kind of out of sight but this is its home for now. I love this pumpkin. 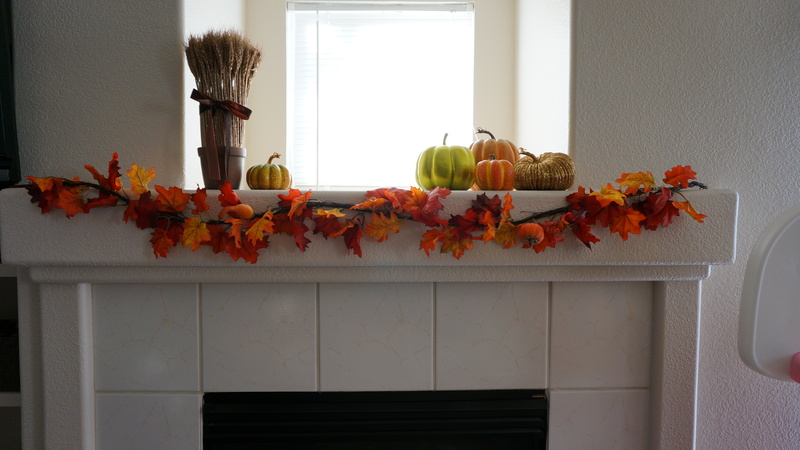 I love how the mantle turned out. 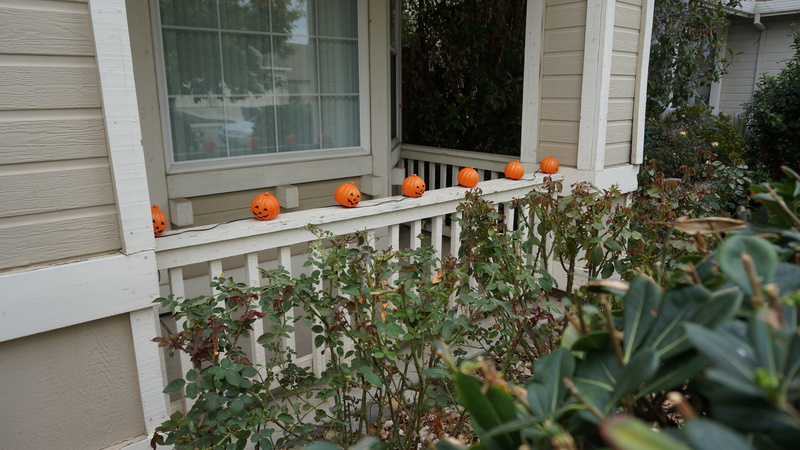 I only had the pumpkins out and it felt like something was missing. Then I found the golden wheat. It’s hard to tell how beautiful it is in the picture but it is so pretty. And it glistens when the light shines through the window behind the mantle, so pretty. 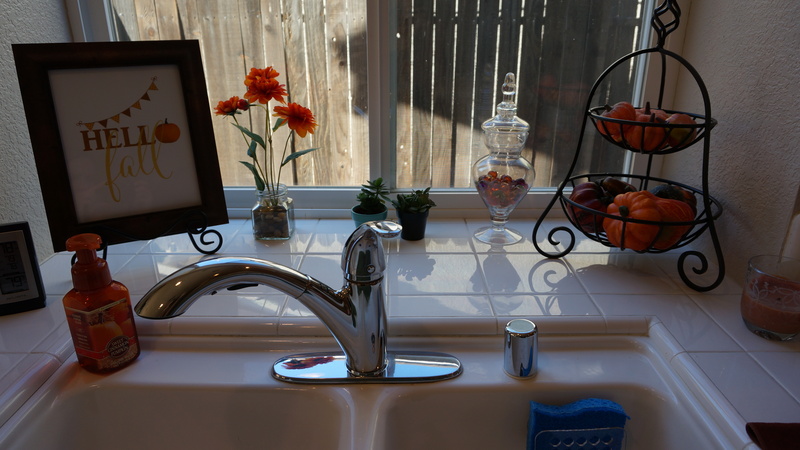 I absolutely love this little area behind the sink. It’s the best place for decorations and I’ll be able to easily customize the area for each holiday, the possibilities are endless! The best part is that the Hello Fall print was free! 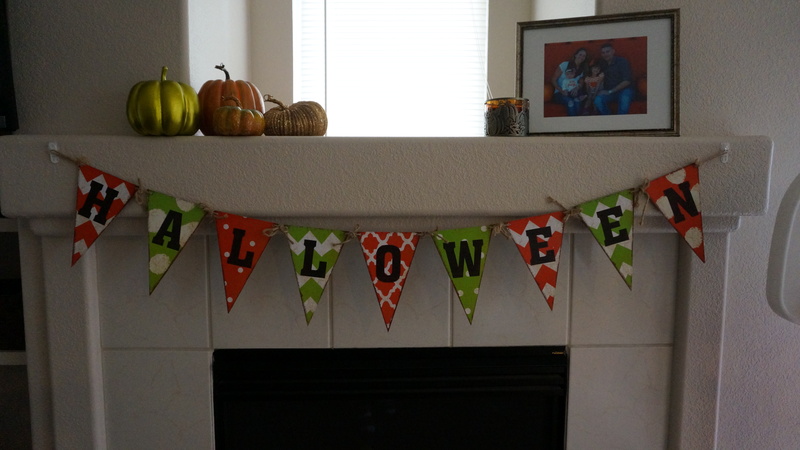 I found it online by googling free fall printables, so easy and hello, free! 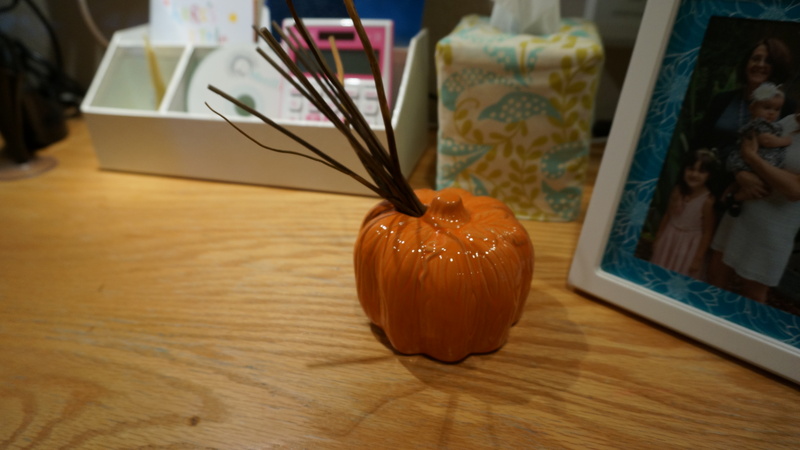 Here are more of decorations from around the kitchen including the best pumpkin spice candle there ever was. 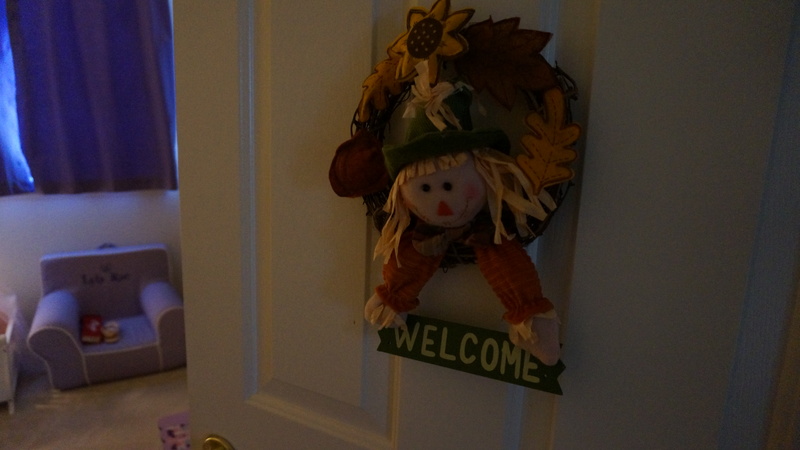 This cute scarecrow welcomes you into Lyla’s room. She has two small Fall decorations in her room. 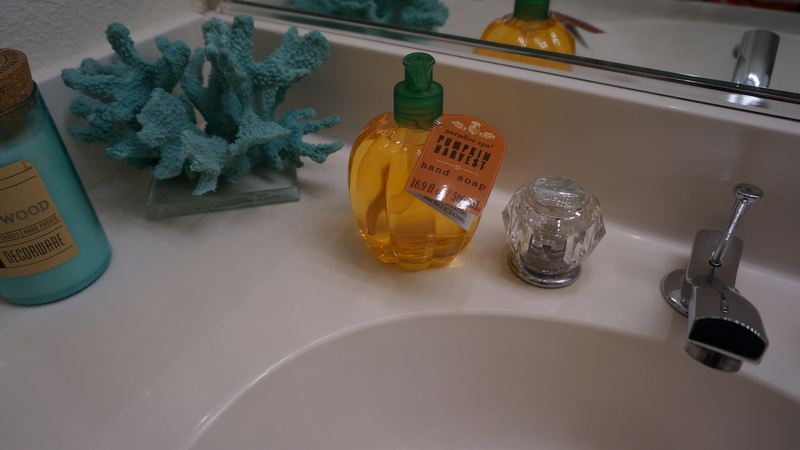 And of course pumpkin soap in her bathroom. 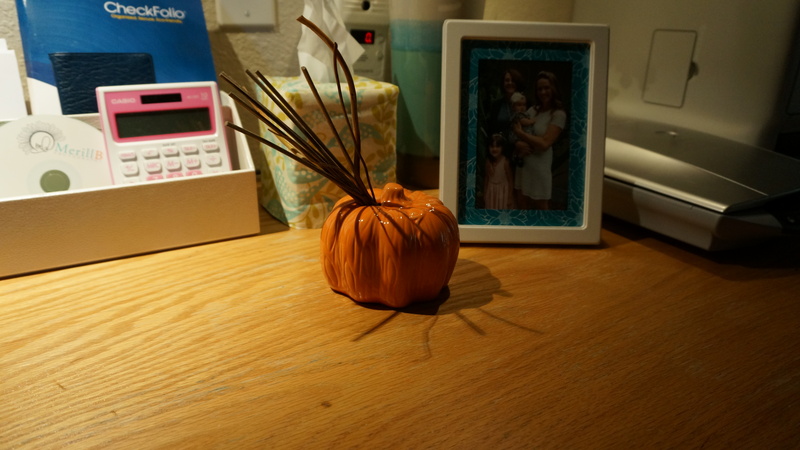 I only added one thing to our bathroom and that is a tiny sweet cinnamon pumpkin candle from Bath & Body Works. OMG that smell. I could take a bath in it and I do… I have the body wash too. I love this candle so much because it’s the favor we gave out at Sophie’s baby shower. It always makes me think of my sweet girl. And there you have it, my Fall decorations. I honestly enjoy decorating my house for each season so much. It makes me so happy to make my house into a home and the best part is that my family truly loves and appreciates all the effort that I put in to doing this. That is what makes it all worthwhile, making my family happy, and the older Lyla gets, the more she gets into it and its so fun so go shopping with her. I can’t wait until Sophie can partake too. Now on to Halloween! In my dreams, I am a DIY master crafter. In reality, I never really had the time to do any crafting so I usually relied on the amazingly talented people over at Etsy for my DIY masterpieces. Now that I’m no longer working a typical 9-5 job, I’m hoping to be able to devote more time to flexing my creative muscle and making my own decorations. I like to have a wreath of some sort on the front door year round. 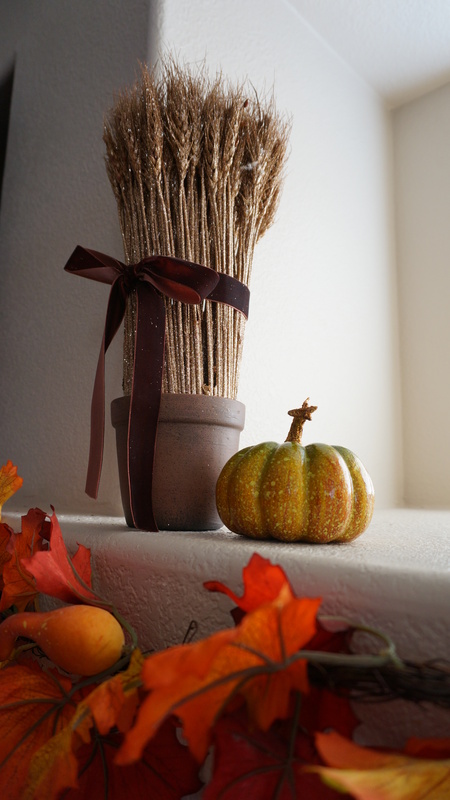 Fall is my favorite season to decorate for, I adore pumpkins so much so that I had a pumpkin-themed baby shower for my second daughter, I will definitely do an entire post on that shower. It was so much fun to shop for and decorate. 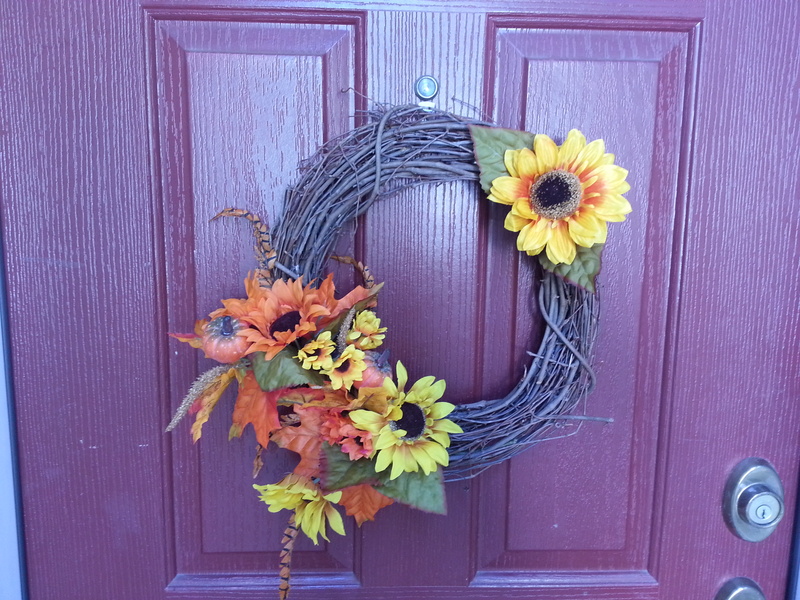 Back to the wreath… I knew I wanted to make some sort of Fall themed wreath and it had to have pumpkins. I had pinned a few ideas to Pinterest and had some ideas of my own but I went into Michaels open-minded to see if I would be inspired by what I saw that day. 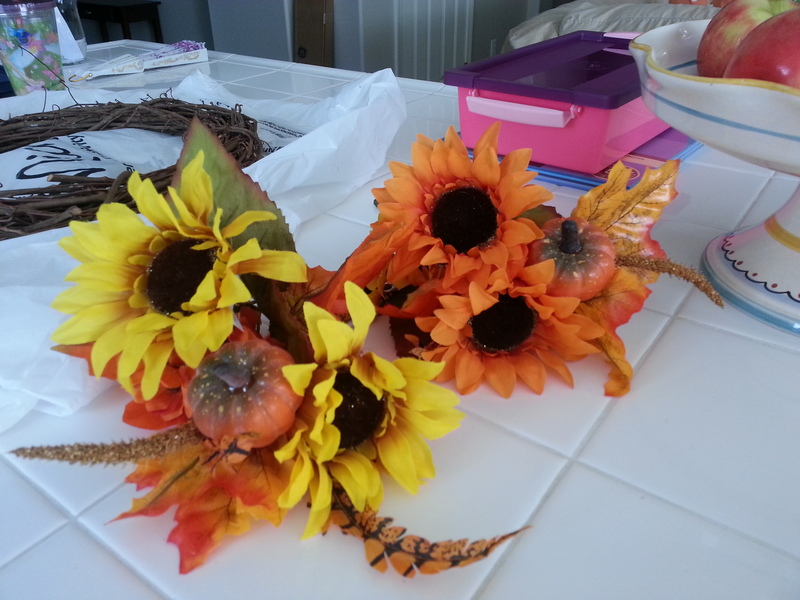 It took me awhile of walking around, going back and forth, picking up and putting down but I ended up walking out with a pre-made twine wreath, two small flower arrangements with fall colors, feathers and pumpkins and one large sunflower. 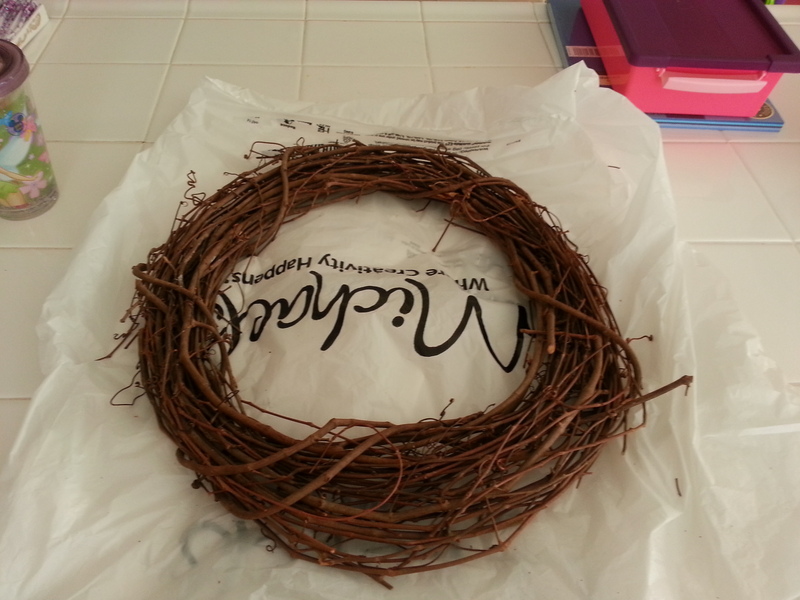 This wreath was super simple to put together and the best part is that the entire thing cost under $10. 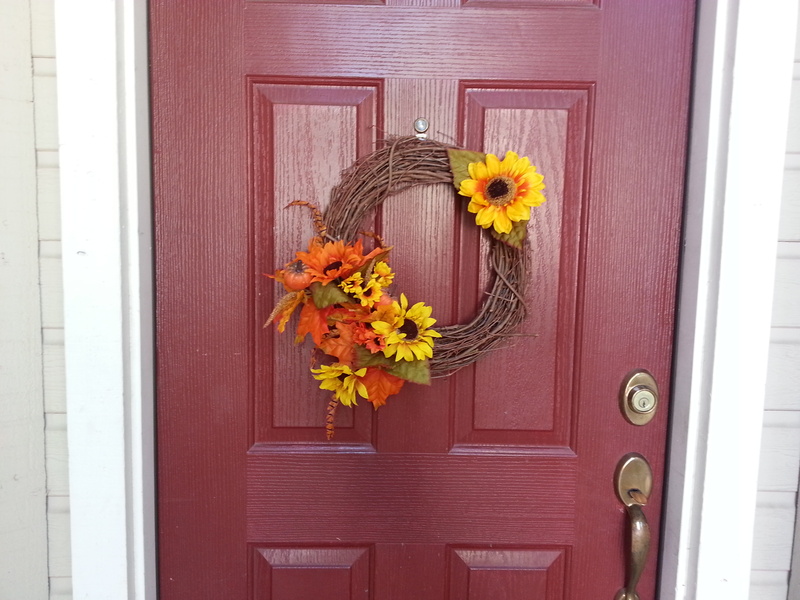 The wreath was $4.99, the sunflower under $1 and the two other small flower arrangements were under $2. I really love how it turned out. 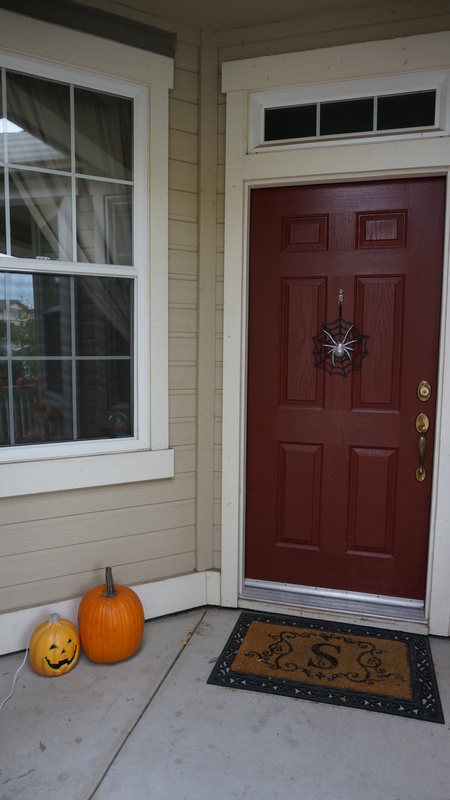 My front door is ready for Fall!